GWT FlexTable is a flexible table that creates cells on demand. It can be jagged (that is, each row can contain a different number of cells) and individual cells can be set to span multiple rows or columns. It is similar to GWT GRID as it also creates tables. Individual cells inside the table can be set to span multiple rows or columns based on indexes. 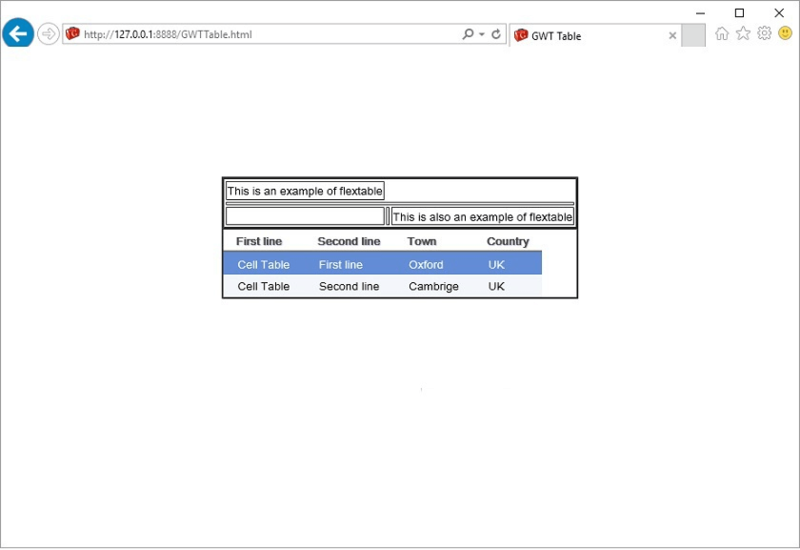 FlexTable.FlexCellFormatter It is a specific implementation of HTMLTable.CellFormatter. public FlexTable() It is a constructor for empty FlexTable. void addCell(int row) It appends a cell to the specified row. int getCellCount(int row) It gets the number of cells on a given row. FlexTable.FlexCellFormatter getFlexCellFormatter() It gets the FlexTable.FlexCellFormatter. void insertCell(int beforeRow, int beforeColumn ) It inserts a cell into FlexTable. int insertRow(int beforeRow) It inserts a row into FlexTable. protected void prepareCell(int row, int column) It ensures that cell exists. protected void prepareRow(int row) It ensures that row exists. void removeAllRows() It removes all rows in the table. void removeCell(int row, int col) It removes the specified cell from the table. void removeCells(int row, int col, int num) It removes a number of cells from a row in the table. void removeRow(int row) It remove the specified row from the table.